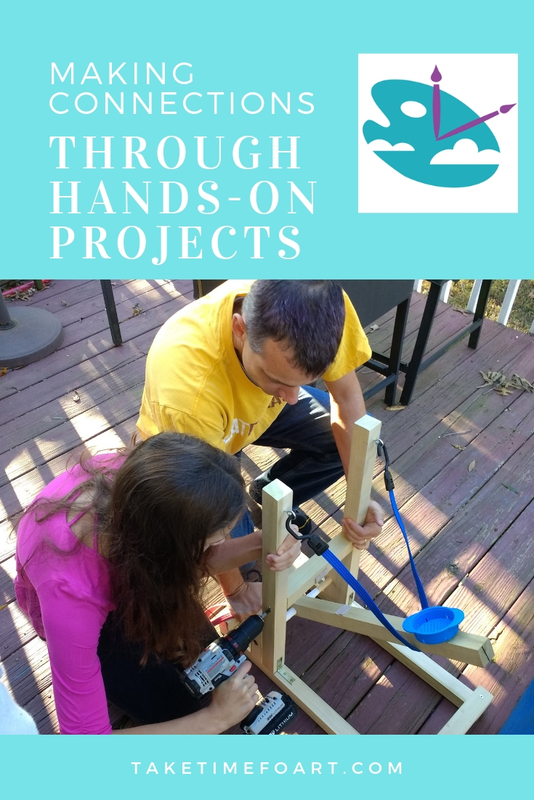 Why go to all of the trouble to do hands-on projects with your children? We’re going to explore a few reasons, and zero in on one of the most important reasons of all- making connections with hands-on projects! In our perfect world of homeschooling, we all dream of having that hands-on project each day that integrates beautifully with our curriculum. The materials would all be in place, the project would go together without a hitch, and the results would be amazing. Unfortunately, life doesn’t always go that perfectly. You forget the glue, the dog eats the paper mache, or you just might not have the energy today for the mess. After 20 years of homeschooling three children, please know that I hear you. But hands-on is important, so I want to give you a few reasons to rise up and try again when project planning gets you down. We all know hands-on is fun, it builds creativity, and best of all, it helps our children remember what they’ve learned. But there’s another reason hands-on is non-negotiable. It helps our children make connections. What are connections? Well, inspiration might be a better word. This is the famous building from Ancient Rome called the Pantheon, built around 125 AD. 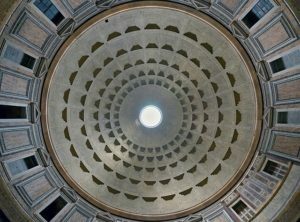 The Pantheon has one of the largest and most astounding domes ever created. It is completely built in concrete and amazed Roman citizens for centuries with it’s beauty. But what is even more incredible is that it has continued to stand for thousands of years due to ingenious engineering. And that engineering was not lost on generations that followed. In around 1300 the city of Florence, Italy began work on a new cathedral. For over a hundred years, the building would start and stop due to the demise of architects, short funds, and even the Black Death. But in 1418 everything was basically in place except the dome. The people of Florence wanted something wonderful, so the town held a competition awarding the commission to Filippo Brunelleschi, a goldsmith with no training as an architect. 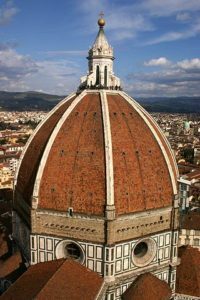 And where would Brunelleschi go to find another dome to help him make connections and inspire? Well the Pantheon, of course. The story of Brunelleschi is worth your time to dig into. He eventually was successful in designing one of the world’s largest masonry domes that still awes us today. And it was those connections he made through the inspiration of other’s creations like the Pantheon that made it possible for him to go further. And It’s Not Just Brunelleschi! Connections inspire all engineers, artists, and creators of any kind to build and create because of familiarity with others’ art. Human creations are not made in a vacuum. This means that to create, we need to be inspired with ideas, and to be inspired with ideas, we need exposure to others work. This is why you want to make that effort to include hands-on in your homeschool. The art of creating builds on itself and inspires more creating. Let me give you an example. In our latest unit for Take Time for Art, The Middle Ages, we explore some of the engineering techniques of the time. One of these creations is the catapult. I truly believe that art and engineering go hand-in-hand so we are including simple engineering projects in our latest units. The trebuchet is one of those engineering inventions of the Middle Ages. So after exploring the history of the trebuchet, looking at great photos and artwork of trebuchets, and finally watching some great “pumpkin chunkin” video, we make the trebuchet’s predecessor, the catapult. And when I say simple engineering, I do mean simple. We make one of those marshmallow catapults that are easy to put together, teach the basics of how a catapult works, and are great for shooting marshmallows at your brother. Making them is great fun and using them is even better! And here’s where the connections and inspiration happened. 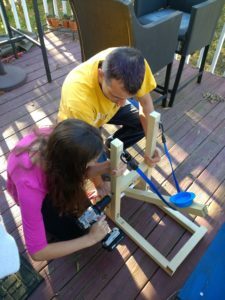 After making one of our catapults, our student from Grace-Filled Homeschooling had an assignment to design and build an egg launcher for a middle school science class. And this is what she designed and built. Do you see her making connections with hands-on projects? Isn’t it amazing how you can give a kid great ideas just by doing hands-on? I love this! At Take Time for Art We Make Hands-on Easy! 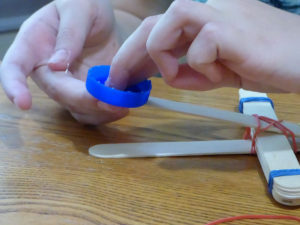 So never downplay the importance of making connections with hands-on projects in your homeschool. And let us help you make it wonderful! We make it simple, inspiring, and fun. It’s why we are here, and why you should Take Time for Art!